Belize boasts a long coastline along the Caribbean Sea and serves as one of the world's top destinations for snorkeling and scuba diving. In a country providing a home for many different ethnic communities, a holiday in Belize ensures visitors experience a blend of cultures sharing a small land endowed with grand natural beauty. As you tour Belize, you'll see dense broadleaf forests sheltering a staggering variety of birds, ancient Maya ruins providing a palpable history lesson, and tiny coastal villages making up in hospitality what they lack in tourist infrastructure. Still relatively unexplored by foreigners, the country offers travelers a chance to experience pristine scenery free of big crowds and pushy souvenir vendors. Belize District: This coastal district, rich in historic buildings, Mayan archaeological sites, and religious sanctuaries, was among the first to be settled by colonial Europeans. Belize Cayes: Besides 386 km (240 mi) of Caribbean coastline, Belize also boasts numerous oceanic islands, atolls, lagoons, and the biggest World Heritage-listed barrier reef in the Western Hemisphere. Corozal: The country's northernmost district attracts visitors with its relatively low cost of living, a significant number of Mayan ruins, remarkable natural scenery, and dive sites. Orange Walk: Tourists love to include this largely agricultural area on their Belize itinerary because of its plantations, diverse communities, colonial structures, archaeological sites, and ecological zones suited for animal spotting. Stann Creek: This region boasts calm coastal towns with a number of popular resorts and restaurants, as well as inland nature reserves rich in tropical plant life, waterfalls, and monkey sanctuaries. Toledo District: This region became popular thanks to the Maya Mountains, which tower over lush rainforests and pine ridge savannahs, cays scattered across the Bay of Honduras, and ancestral villages. Belize City: The nation's industrial and commercial hub, which attracts tourists cruising the Caribbean, the city serves as a good starting or ending point for tours of Belize. Orange Walk: Stop by this agricultural town during your Belize holiday to observe the surrounding ecologically diverse and fertile landscape, explore ancient ruins, and learn about the economic importance of traditional sugar cane plantations. San Pedro: This once sleepy fishing village quickly grew into a thriving town, offering access to tourist resorts and exciting scuba diving spots. Dangriga: Located on the Caribbean coast where the Stann Creek River meets the sea, this town has undergone a cultural revival and represents the nation's center of punta music and Garifuna traditions. Placencia: Placencia tourism primarily focuses on nature explorations and outdoor activities, such as observing dolphins and rays, trekking towards Mayan ruins, and kayaking through mangroves. Hopkins: This small but vibrant community of Garifuna farmers and fishers loves to receive and pamper guests in their quaint bars, traditional restaurants, and shops. 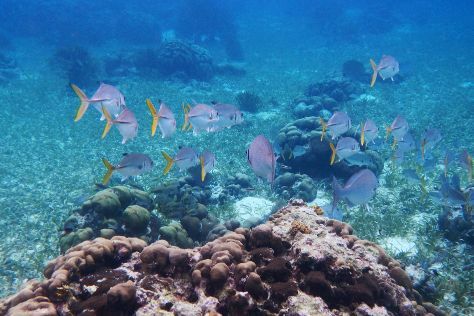 Hol Chan Marine Reserve: Thanks to a diverse marine life and remarkable coral formations, this Belize attraction is considered the nation's top diving and snorkeling site. Caye Caulker: This coral island accessible only by small planes and water taxis became widely popular among tourists thanks to its sandy beaches, diving sites, bird-watching hotspots, and vibrant nightlife. The Belize Zoo: Observe and interact with various native animals, such as pumas, eagles, and ocelots, in a protected tropical savannah environment. Cahal Pech Mayan Ruins & Museum: This site represents a palatial hilltop home of an elite Mayan family, strategically located to overlook the confluence of the Mopan and Macal Rivers. Xunantunich: Expand your Belize itinerary by visiting this site famous for its elaborate ceremonial structures, such as palaces, observatories, pyramids, and plazas. Green Iguana Conservation Project: Take part in interactive programs and explore exhibits dedicated to endangered green iguanas of Belize. Actun Tunichil Muknal: This cave located in Tapir Mountain Nature Reserve contains calcified skeletons of people probably killed during sacrificial ceremonies. ATM Cave Tour: Go on an exciting and challenging hiking tour through Tapir Mountain Nature Reserve to reach a major cave site. Altun Ha Ruins: Take a guided tour to explore an ancient Mayan city containing remains of 13 structures, a ceremonial temple, and two main plazas, located in an environment rich in wildlife. Shark Ray Alley: No Belize holiday would be complete without visiting this dive site located on the country's largest island, which is a famous breeding ground for sharks and rays. Compared to other Central American countries, Belize is much more affordable and safer, making it a perfect place for families interested in observing indigenous wildlife and enjoying sandy Caribbean beaches. Belize City and San Pedro in particular offer plenty of kid-oriented attractions, which include zoos, snorkeling sites, and sunny beaches. To include nature in your Belize itinerary, visit Placencia or Belize Cayes, excellent destinations for families eager to explore rich marine environments and oceanic wonders. Introduce your kids to Belize's ancient Mayan culture by visiting Toledo and Cayo districts. These regions are known for their family-friendly villages and exciting archaeological sites, making them a suitable option for a holiday with children. Although most family-friendly attractions are typically located at the seaside, Belize also boasts a variety of inland natural and cultural wonders, which children find inspiring and adventurous. To introduce your children to the diversity of Belize's wildlife, take them to The Belize Zoo, where they can come face to face with a variety of majestic creatures. Traveling to Mayan archaeological sites can be very tiring for kids, but you can always avoid exhaustion by visiting museums, such as Maya Center Mayan Museum. Mountain Pine Ridge Forest Reserve is an excellent place for kids to enjoy hiking trips and experience the natural wonders of Belize in a safe environment. If you have chocoholics in your family, visit Belize Chocolate Company to taste a variety of delicious treats. Central Belize is packed with lodges, which offer tons of activities like caving adventures, visiting botanic gardens, and exploring jungles, which may prove to be more memorable than staying at a typical tourist resort. The country's inland areas tend to be quite moist and swampy, making them excellent breeding grounds for mosquitoes--pack plenty of insect repellent, especially when you bring your kids on hiking trips through forest reserves. Attending festivals and public events is one of the more popular things to do in Belize, but some street parades may be inappropriate for younger children. Inform yourself about the nature of these events before you expose your family to more than you intended. Renting a car may be a more costly solution than riding public buses, but it will certainly ensure comfort and save you time in the long run. Belizean cuisine represents a mix of Caribbean, Mexican, Mestizo, Kriol, Garifuna, and traditional Mayan influences, with each region offering something unique for you to try. Belizean Kriols, who mostly live in urban areas, love to combine boiled eggs and fish with sweet potatoes, cocoa, yams, plantains, and tomatoes. They also often combine beans and rice with some type of meat, seafood, and salads, and make stewed dishes with chicken, pork, beef, fish, lobster, and even iguana. Home to the Garifuna people, Stann Creek is the best destination to visit during a Belize holiday if you want to try dishes with a distinct African influence. Make sure to try popular dishes like ereba (cassava bread) served with seafood or gravy, bundiga (gravy with grated plantain), and bimacacule (sticky sweet rice). In Toledo District you can taste favorites like caldo (chicken soup), tamale (steam-cooked corn dough), and tortillas, usually served with meat, beans, vegetables, herbs, and sometimes fruit. If you want to peruse at a wide range of spices, oils, sauces, vinegars, and beauty products, check out Caribbean Spice Belize. To look for jewelry, visit Diamonds International, a popular duty-free establishment. Local vendors frequently set up food and crafts carts in the street close to the cruise ship port in Belize Tourism Village, and nearby you can also find many jewelers, clothing outlets, and souvenir stores selling items symbolizing Belizean heritage. A variety of acrylic paintings, sculptures, masks, handmade chairs, and wood table bases can be found at The Gallery of San Pedro. Belize is at the forefront of ecological tourism with over 95 protected areas, so be respectful of nature and mindful of your surroundings. Do not carelessly dispose of trash, especially during your nature tours, and refrain from picking plants. The cays are known for their laidback atmosphere, so expect activities and services to run a little late. Water taxis are known for their ever-changing schedule. Snorkeling may be one of the most entertaining things to do in Belize, but be extra careful not to touch or stand on the corals. They are protected and quite delicate species. When visiting nightclubs, stick with your group and do not be the last one to leave. Petty theft is common in Belize, and muggers usually prey on the lone and intoxicated tourists. People of Belize love to organize grand community events, which include energetic national parties and religious and cultural festivals. In February before the Lent, Belize holds the popular Fiesta de Carnaval, with the most exuberant celebrations in San Pedro. March is a month reserved for remembering Sir Baron Bliss, a wealthy British traveler who left a part of his fortune to what was then British Honduras. Bliss is honored during National Heroes and Benefactors Day. On that day, Belize City hosts sailboat and horse races, as well as kiting competitions. Lobster festivals during June and July draw visitors to coastal towns, where the locals prepare various lobster dishes, enjoy music, dance, and drink pina coladas. In August, a five-day music event called Costa Maya Festival is held in San Pedro. This festival unites lovers of good music and fine cuisine. If you happen to be on your Belize vacation at September 21, you can attend colorful parades and parties held in honor of the nation's independence. Although Belizeans are considered quite friendly and kind, they generally do not show much physical affection. Men usually greet each other with a firm handshake, or with a simple pat on the shoulder. Women may kiss or hug one another in public. English is the official language in Belize, but you can also use Spanish or Creole, depending on the region you chose for your holiday. While on a Belize vacation, keep in mind that the locals dislike confrontation and prefer to use tact in conversations. Start your interactions with small talk, neutral subjects, or polite inquiries about general well-being first. It may take some time to gain the locals' trust, so be patient and respectful. The climate of Belize is subtropical, although temperatures may vary slightly in jungles and coastal regions. Humidity is high, but masked by the cooling sea breezes. The average temperature is 29 C (84 F), remaining fairly consistent throughout the year. Winter temperatures rarely drop below 16 C (60 F). The dry season lasts between February and May. June through December marks the wet season, during which certain parts of the country receive heavy rain and wild storms powered by the warm waters of the Caribbean. Although the wet and dry seasons both have their pros and cons for tourists, a vacation in Belize is actually quite enjoyable all year round thanks to the mildness of the country's weather. Belize City with its international airport is usually the starting point of a Belize holiday for most travelers. Belize's coastal towns are also among the destinations visited during cruise ship tours across the Caribbean. Well-planned highways and road systems connect the main towns, villages, and popular attractions. Despite this, some archaeological sites, such as Caracol, remain difficult to access due to unpaved roads. The cays are known for water taxis, regularly scheduled to operate between Belize City, San Pedro, and Caye Caulker. Small airports are located around major points of interest throughout the country. Belizeans do not tend to look for tips, but recent development of tourism is slowly changing this social custom. Since most restaurants in Belize do not include a service charge and salaries are fairly low, feel free to add up to 15 percent of the total for serving staff. You can also leave a symbolic amount for hotel cleaning staff (per night) and bellhops (per bag). Taxi drivers, street food vendors, and crafts sellers do not expect tips. Tipping with cash during your Belize vacation will allow you to directly decide who receives the reward--credit card tips may end up in the wrong hands.